True Confessions Time: Shaker One has an entire shelf in her fridge devoted solely to all things fizzy. I use bookends to hold up the rows of bottles. Mostly its a few varieties of proseccos, kept on hand for whenever the mood hits. Currently there’s also that bottle of South African bubbly I’ve wanted to try but just haven’t found a reason to open, next to the bottle of Schlumberger White Secco. And of course, the ever present emergency champagne bottle remains at the ready at all times (usually Moet). Shaker One Life Rule: Like pearl earrings or a little black dress, a lady always keeps a chilled bottle of champagne on hand for any emergencies. 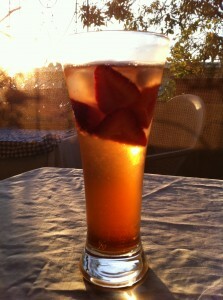 Take a tall glass, add a splash of Chambord, a bigger splash of Rose’s Lime (or lime juice and simple syrup), a few dashes of bitters (like Angostura), add ice, fresh berries top with sparkling wine and stir. This is a unique take on the traditional champagne cocktail. Not sweet, with a complex layered flavor that is still completely refreshing. This is a great way to kill the last of the bubbly in last night’s bottle. I shall make this one again very soon. Pop your corks and enjoy!